In the rush to talk tough on the deficit Alistair Darling is expected to announce an end to Labour’s limited-time-only 2.5% cut in VAT this year. That means VAT will go back up to 17.5% or, if Darling’s feeling even more stern, to 20%. Since VAT is one of the most regressive taxes this gives the Tories a golden opportunity to shun a tax rise that hits the poorest, hardest. 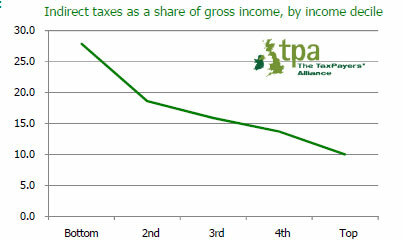 The chart from the Taxpayers’ Alliance [pdf] shows that the poorest quintile pay over ¼ of their in indirect taxes, the richest only some 10%.